All you dishwasher-having SQ readers, this post is for you! While having a dishwasher is a total privilege, if you’re able to have one (ideally an efficient, Energy Star model), they generally use less water and energy than hand washing (not to mention they’re a time saver as well!). We cook almost all of our meals at home, and, as a result, we create a ton of dirty dishes. Plus, we have streamlined our dish and pot collection, so we have to keep up with the dishes or we won’t have anything to use for cooking or eating. We still do a fair amount of hand washing, since we cook multiple times a day and only run the dishwasher when it’s full...so, we find ourselves using the Spaghetti Scrubbers we wrote about last month for our hand washing needs. We haven’t yet found a suitable DIY dish detergent for hand washing (not for Kristl’s lack of trying), but we do have one we love for the dishwasher! Our household is nearly completely fragrance-free, which often makes finding soaps and detergents difficult. When we moved into our new place in December, we went to the nearby Whole Foods and grabbed some “natural” dishwasher pods. We got them home and were aghast to find that the pods in the cardboard box were individually wrapped in plastic. This completely went against our desire to use less plastic (though, honestly, we should have done a bit of research before purchasing - nobody’s perfect!). Well, that was the first and final straw. (You know we don’t use plastic straws, either.) If you look in the archives, you’ll see we make our own laundry detergent (link to post). It was time to find a good dishwasher detergent recipe. I did some research and found this fun play-by-play post by Houselogic, in which they tested six different detergent recipes against oatmeal stuck on a glass lid. I kind of wish they had also tested something greasy, but the oatmeal test was interesting to learn from. We took the most effective recipe from Houselogic and have tweaked it a little bit. Before you ask any questions, here’s a couple things you should know. Washing soda is baking soda that has been heated up to change its chemical structure a little bit. It’s great at all sorts of cleaning, including removing greasy build-up and it’s just as safe and sustainable as baking soda. You can find it in most super markets in with the laundry/cleaning supplies. Borax is sodium borate and it’s known for its ability to get stuff really fricken’ clean. Crunchy Betty did an in-depth post on borax, which we found helpful in deciding if we were comfortable using borax in our DIY detergents (clearly, we decided we’re fine with it, but you may want to check out that article for more information). The Kool-Aid/citric acid helps with shining up those glasses and making everything smell nice and fresh. We cut back on the mix, because six packets seemed excessive. We don’t really want our stuff to smell like lemon or Kool-Aid. To make this dishwasher detergent, mix the ingredients together thoroughly and store it in a jar with a tight lid. We use 1-2 Tbsp per wash. One other thing we do, especially if there is a lot of grease on our dishes or if we have a lot of glasses in the load, is we add vinegar to the rinse aid section of the dishwasher. Your mileage may vary with the vinegar, depending on how hard your water is, but it’s worth trying. Sometimes the detergent does clump, but it’s nothing a few scrapes with a fork can’t fix! Oh, and making your own detergent is totally worth the money. The pods we bought at Whole Foods were at least $0.20 a wash, now we’re paying a cent or two at most. If you make a lot of dishes and you have 10 minutes to measure out ingredients once a month, it’s totally worth it. Have you ever made your own detergent? What’s your go-to recipe? Let us know in the comments! Rachel was stoked about our Who Gives a Crap delivery! 4. Shopping at the Farmers’ Market/Co-op: This isn’t a specific service or product, but choosing to shop locally and put our food dollars back into the local economy is something we do intentionally every week. We know how hard it is to be a farmer (Rachel does especially, from first-hand experience) and so we want to make sure as much of that money as possible goes directly into their hands. Also, the closer to harvest you get the veggies, the better they taste. Being a member of a co-op means you are a decision maker and eligible for member discounts, and at some co-ops you might even get a dividend. 5. Kootsacs: We have been working hard to reduce our plastic usage because plastics are not too kind to the Earth, from start to finish. Kootsacs are made out of ripstop nylon or silk and used for getting bulk food from grocery stores. We have three of the silk variety and they last forever and are completely washable. We have put everything in them from sugar to nuts to lentils to spices. They recover completely in the wash and are ready for another trip to the store. Kristl always has at least one in her bag in case she finds herself at the store unexpectedly! Aren't those whales so cute?! 6. Use your own reusable utensils and straws: More than 100 million pieces of plastic utensils and move than 500 million plastic straws are thrown away in America EVERY DAY. One of the easiest ways to help the planet is to refuse single use cutlery and plastic straws - and if you want to go even greener, bring your own! We use this cutlery holder from Don’t Waste Durham (available for sale at that link or at a variety of events around Durham, if you’re local) - it comes with bamboo cutlery, a stainless steel straw + straw cleaner, and a cloth napkin, all in one easy-to-transport cloth roll. They sell them on their website (and at local events, as well). Prior to using the cutlery holder, Kristl kept two metal forks in her bag at all times, but the cutlery holder is much more useful (and Kristl’s way less likely to stab herself on tines when she reaches into her bag now). 7. Reusable menstrual products: We promised a post on these years ago and haven’t yet delivered, but it’s coming! We both use Lunapads and Kristl also uses a menstrual cup (GladRags is also a well-known reusable pad company). While reusable menstrual products can cost more than disposables up front, they are significantly cheaper in the long run. Our Lunapads have been going strong for well over 5 years (probably even longer) and a few of them are just now starting to show signs of wear. Most recently Kristl used the Lunette menstrual cup and loved it, but the silicone showed some cracks after 3 years of use, so she decided to try out the Stem Cup from Tulip Cup this time around. The Diva Cup is the most well-known cup around, but there are a ton of different cups out there - and a number of guides on how to find the best cup for you. We like this recent one from Wirecutter. Making use of our GreenToGo membership! 1. GreenToGo: In Durham, a local non-profit called Don’t Waste Durham sponsors a reusable take out container program called GreenToGo. If you follow us on instagram (@SustainablyQ) you will have seen a couple of pictures of us with the telltale hard plastic green clamshells (like the one on the right). We just learned yesterday that GreenToGo is expanding into pizza boxes, soup containers, and more. The yearly membership is $25 for one box (they also have multi-box plans) and they just keep adding restaurants. No more styrofoam! If you live in Durham and ever get take out, please get GreenToGo! 3. The Scrap Exchange: “The Scrap Exchange is a nonprofit organization with a mission to promote creativity, environmental awareness, and community through reuse.” The essential awesomeness of The Scrap Exchange is how they accept and sort and sell an amazing collection of almost anything you could imagine and everything you couldn’t. They’ve got scrap wood, fabric, paper, test tubes, bottle tops, CD’s, sewing machine cases, tubes, picture frames - and that’s barely scraping the surface. It’s the epitome of one person’s trash is another one’s treasure. You really have to experience it to understand it. If you have any clutter whatsoever in your home, the patrons of The Scrap Exchange will find a way repurpose most of it. They also recently opened a thrift store as well, for more “traditional” second-hand goods. We got this sweet little cactus at Urbane Terrain today. 4. UrbaneTerrain and The Zen Succulent: We are still settling into our apartment in Durham, and being plant loving people, we have gradually been adding living things to the space. The Zen Succulent and Urbane Terrain are two separate local plant shops that are owned and run by people who are not cis white men and we're always looking for ways we can support local businesses run by marginalized folks (we haven't asked specifically how they each identify, though, so aren't including that information here). We are so excited to add beautiful plants to our home from each of these businesses and we hope they (the plants and the businesses) continue to thrive. 5. Fillaree - A zero-waste business that makes refillable, sustainable soap and cleaning products! Small batch, handmade, organic, vegan, synthetic-free - it doesn’t get much better than that. They also make body butters and bath soaks. There are refill stations available at a number of places in Durham and they also recently opened a storefront. More exciting, they’ve just launched a mail order subscription service, so you can use their refillable products anywhere you live! We love the Spaghetti Scrub! We cook a lot here in the SQ household, which means we do a lot of dishes. Thankfully, we do have a dishwasher in our current apartment, but many of our items get used (and therefore washed) multiple times before our dishwasher is full enough to run. We’re always looking for ways to reduce waste and we realized that our kitchen sponge game needed an overhaul. In doing some research for this post, it seems sponges should be replaced anywhere from every 2-3 uses to every month, depending on how often you sanitize them. Our previous apartment didn’t have a microwave and, honestly, we weren’t great about boiling our sponges on the stove to disinfect them. We also didn’t have a dishwasher, so we went through sponges like woah - usually because they were smelly, but sometimes because they lost their scrubbing ability. Over the years, we have used several different types of “natural” sponges or kitchen scrubbers made from natural fibers and synthetic fibers. We’ve tried using dishcloths in the past, but found that we almost always require something with more scrubbing power for our cooking habits. So, for the past while we’ve been buying four packs of Scotch-Brite Greener Clean sponges, with a undyed rough surface on one side and a beige sponge on the other. They were easy to find in our local grocery store or Target and did the job well. However, they come wrapped in thin plastic and are not that great for the environment. Gentle scrub made from peach pits on the left, coarse scrub made form corn cobs on the right. Last fall, we started looking for alternatives that packed that scrubbing punch we needed, but were also environmentally friendly and didn’t come wrapped in plastic. That’s when we discovered the Spaghetti Scrub from Goodbye Detergent. When we purchased the Scrub, it came in a pack of two - one made with peach pits for more gentle scrubbing and one made with corn cobs for tougher jobs - and a stainless steel rack to keep them in. The Scrubs are made of cotton and polyester and look like sandpaper noodles. The description indicates that they will last for months; we’ve had them for over four months so far and they don’t seem to be showing signs of wear. Since we started using these last November, Goodbye Detergent has changed the product a bit. Instead of having a gentle scrub and a coarse scrub, they now offer one that falls between the two - more of an “all purpose” option. It’s made of 100% cotton, rather than cotton and polyester, which means it should be biodegradable as well. Our Scrubs as of today, April 15. Super curly, still very scrubby! To use the Scrubs, wet them with water and scrub away - that's it! With use, they curl up, making them look a bit more like fusilli than spaghetti. After washing your dishes, squeeze the scrub out, then place in the stainless steel holder to dry. If needed, they can be sanitized in the microwave or dishwasher, but we haven't found that to be necessary. We've thrown all sorts of dirty dishes at our Spaghetti Scrubs and they've been up to the challenge each and every time. We use a fraction of the dish detergent we used to use, which means we're using less plastic, since we're not buying detergent nearly as often (our adventures in homemade dish detergent were disappointing, sadly). Overall, trying the Spaghetti Scrubs was a successful kitchen experiment! They require little to no detergent for use. The corn and peach cobs are abrasive so you don’t need a lot of soap to remove crusty bits from dishes or pots. They dry out very easily. They last forever compared to sponges. The packaging is 100% recyclable and included no plastic. If you can’t tell, we’re head over heels for our Spaghetti Scrubs. When our current ones wear out, we’ll definitely be purchasing the new all purpose option - and of course we’ll update y’all on how that one fares when the time comes. For those of you who want a close up of the instructions and materials, click here. What do you use to wash your dishes? Traditional kitchen sponges? Dishcloths? How often do you replace them? Would you try the Spaghetti Scrub? Let us know in the comments! Sustainably Queer is Officially Back in Action! Art in Bloom, North Carolina Museum of Art. March 2018. Oh, hi there. It’s been a few years, hasn’t it? Sustainably Queer was on hiatus for a while and perhaps you thought you’d seen the last of our plucky queer urban homesteading blog. Well, we’re excited to say that we’re bringing SQ back! We’re bursting with ideas and things to share, but first let’s catch up on what we’ve been up to since our last post in the summer of 2015. Riding the kiddie train on Rachel's birthday. Pullen Park, September 2017. Back then, we were living in Chicago. 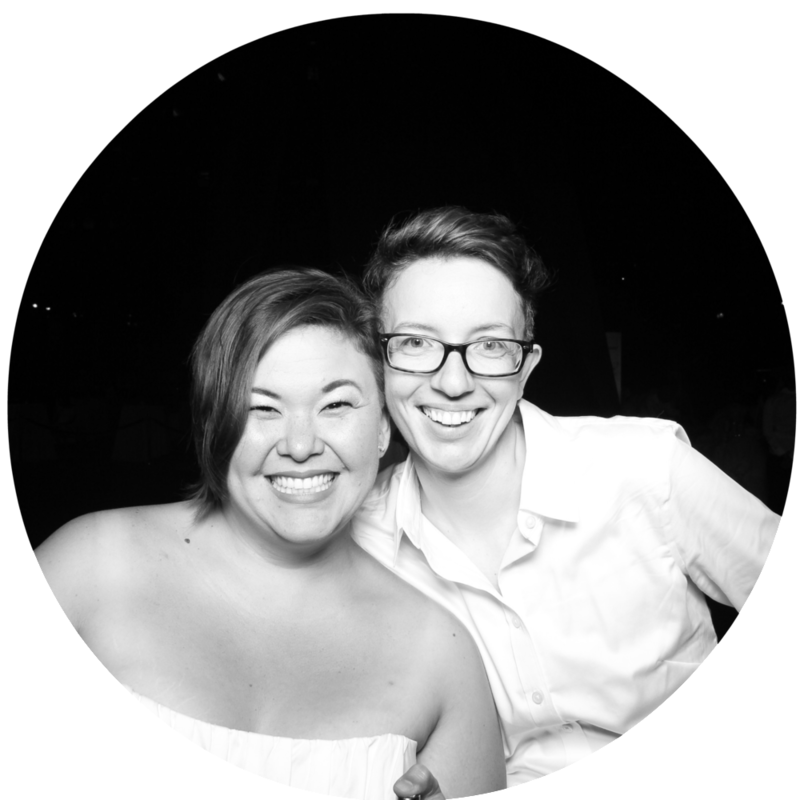 Kristl owned a busy acupuncture clinic on the North Side and Rachel was planning on working in urban agriculture in the city, while adding more interesting content to SQ. In May of 2015, Rachel was diagnosed with a serious infection that required emergency surgery, over a week in the hospital, and months of home health care. We initially tried to keep the blog going, but it proved to be more than we could handle at the time. This life and death emergency caused us to reevaluate our priorities and shake things up a bit. Kristl sold her practice and we moved to the Triangle area of North Carolina in the fall of 2015. Our transition to North Carolina was a bit rocky and, sadly, sustainability ended up taking a backseat as we focused on merely surviving for a while there. Some of the upsides were that we started (and later ended) a business through which we launched a podcast, taught some online courses, and, most importantly, learned a ton about ourselves. Also, Rachel was able to do some work for a production farm and we’ve been able to spend way more time out in nature - hiking, kayaking and exploring - now that it’s so close to home. During our first two years in North Carolina, we lived in Chapel Hill, which is very much a college town and we never quite felt like we fit there. We have recently moved to nearby Durham, and it has proved to be a much-needed shift. Durham really feels like home and has helped us get our groove back, y’all! Durham might not always register nationally when it comes to sustainability initiatives and green living, but this city is known for grassroots work and there are tons of folks pushing hard to make Durham more sustainable. We’ve only been living here a few months and we have so many cool programs and businesses to tell you about, like Durham GreenToGo, Fillaree, CompostNow, Ungraded Produce, Don’t Waste Durham, and more! At a solar eclipse party put on by the Museum of Life and Science in Durham. August 2017. In personal news, Rachel has recently started as the Sustainability Steward of Pie Pan Inc, a small restaurant group in town which is a B Corp--a Benefit Corporation, benefiting People, Planet, and profit, in that order--and she’s been having a blast helping them with both their environmental sustainability efforts as well as advising on the sustainability of the business as a whole. Kristl has been working remotely for a tech company for about 18 months and she loves it. It’s basically the best combination of the flexibility you get from entrepreneurship and the stability you get from a job - she couldn’t imagine a better job for her. We hope you are here for the next phase of Sustainably Queer, because we’re here, we’re queer, and we’re reducing, reusing AND recycling. If there’s any content you want to see from us, be sure to reach out at hello(at)sustainablyqueer(dot)com and follow us on social media. We’d love to hear from you! Hello everyone! It's been an interesting summer for us! As you may have noticed, if you were a constant reader or a casual observer of date stamps, that our blogging has dropped off in recent months. We are officially on hiatus. We are still very sustainable and very queer. However, a rash of personal circumstances have caused us to be less available for spending time with Sustainably Queer this season. Until then, you can follow us on our personal Instagrams - @kristlyuen and @schipmoney - to see what we've been up to lately (and find pictures of our pets because that's what Instagram is for, right?). If you want to get in touch, you can always reach us at sustainablyqueer@gmail.com. It’s June in Chicago. Which means that it’s sometimes warm and sometimes cool, but it really does feel good to get outside. However, for a lot of city dwellers, those of us at SQ included, we still find ourselves cooped up inside regardless of the weather, working, starting at computers, and not really enjoying all that nature has to offer. No matter where you live, it can be a struggle to disconnect and go sit out in the yard for a few. So, we wanted to issue a challenge and make it visual. We want you to commit to 10 days of spending at least 10 minutes outside, in a spot of your choosing, and post a pic each day on Instagram, with the hashtag #SQNatureBreak. Challenges are all about commitment and accountability. We’ll be participating right along with you, but we want to know who is in. Sign up through this link and we’ll send you an intro email the day the challenge starts with some suggestions to make it go smoothly. If you don’t use Instagram, you are still welcome to participate, you can even post the pictures in our Facebook Group! Remember, this is about taking a break from the hustle and bustle and chilling out with the birds and the trees. Or the bees, if you are into that. Everybody needs a little SQ Nature Break. The challenge starts Wednesday, June 17th, sign up today! We're back! Sorry for the lack of posts in the last few weeks, we've been dealing with some unforeseen circumstances in our household. Nevertheless, we're working on getting back on track, and we have a special treat for you! Below is the first part of a two part interview with Jody Osmund of Cedar Valley Sustainable Farm. Jody wears a lot of hats when it comes to advocating for sustainable local food in our region. This first part will cover his farm specifically, and in part two you will hear him talk about his work with Band of Farmers, the Chicagoland CSA coalition. In a paragraph or two, please introduce yourself and tell us about how you became a farmer (what did you do before farming, how did you make the transition, how did your family adjust, etc.). I grew up on a diverse grain and livestock farm - cattle and hogs, oats, wheat, hay, corn, and soybeans. My mom kept a flock of 150 laying hens and egg sales supplemented the grocery budget. I was mostly involved in taking care of the animals, and I spent a lot of time helping in the ¼ acre family garden. This background, however, was not a straight line to me becoming a farmer. I graduated from high school in the middle of the farm crisis of the late 1980’s. Farming as a career looked pretty bleak, so I went off to college and a professional career. Fast forward a decade and a half… On the morning of September 11, 2001, I was at an apple orchard in the northwest suburbs with our almost 3 year old son for a daycare field trip. We rode a hayrack, picked apples, drank cider, and ate apple cinnamon donuts. When the Enron scandal caused Arthur Andersen to collapse and family land (and farmhouse) came available in 2002, it was an easy decision to move to the farm. Our suburban friends thought we were crazy – they probably still do – but were supportive nonetheless. One of our friends gifted us (thanks Vickie!) Eliot Coleman’s book, The New Organic Grower which became a much used reference and the chapter on marketing inspired us to jump into Community Supported Agriculture. Tell us about your farm, where it is located, how big it is, and what you produce there. Cedar Valley Sustainable Farm is a few miles north and east of Ottawa, IL. The total acreage is about 90 acres, but over half of that is taken up by woodlands, wetlands, and riparian habitat. We have about 40 acres of the arable land in pasture (mixed grasses, legume, and forbs) where we raise cattle, pigs, meat chickens, layer hens, and a small flock of Navajo Churro sheep. If we were to visit your farm, what would we find distinctive or unique about it? What makes Cedar Valley shine? We’re really proud of our farm’s biodiversity. This diversity extends well beyond the livestock (Duroc and Hampshire hogs, Angus cattle, 8 breeds of laying hens, and Navajo Churro Sheep). Our farm hosts a number raptor species (Bald Eagles, Red Tail Hawks, Kestrels, owls), water fowl (ducks, geese, Sandpipers, and Great Blue Herons), song-birds, predators (fox, coyote, racoons, opossum, mink), herbivores (deer, rabbits, beaver, voles, gophers, squirrels), along with countless insects (including a lot of native pollinators and butterflies, some feral honeybees, and dragon flies), and incredibly active living soil. It’s much different than the sea of corn and soybeans on the farms that surround it. The most distinctive feature of the farm is the creek that runs through it. It is the highlight of our farm tours, provides a peaceful picnic spot, cools us in the hot summer, and occasionally provides a meal of fish for the table. Why did you decide to run a meat CSA out of your farm, as opposed to other options like vegetable farming, or selling meat wholesale to restaurants? Actually, Cedar Valley Sustainable (CVSF) started out as a vegetable CSA in 2003. We started on 2.5 acres and increased to a maximum of 5.5 acres. We added livestock over time, started the first meat CSA in Illinois (while serving a 70 member vegetable CSA) in 2007, and fully transitioned to meat and eggs in 2008. How did you decide to raise beef, pork, and chicken? Which did you start with and how have you scaled up production over the years? The first animal we brought to the farm was a dairy cow. Next we added a flock of laying hens. Meat birds followed, along with more cattle and then hogs. We raise all meat chickens and eggs for our CSA on our farm, but not all of the beef and pork. Over the years we’ve developed relationships with neighbors who breed incredibly high quality pork and beef that supplement our production. These relationships extend the scope and breadth of our work toward more sustainable farming, writ large. They also give us flexibility and elasticity to deal with the ebbs and flow of CSA membership and farmers market demands. When we started working with pork breeders Mark and Kristen Boe of La Pryor Farms, they were considering getting out of the pig business (commodity pork prices were very low and they were losing about $40/per pig they sold to Tyson). We helped them develop a profitable farm-to-restaurant business for their hogs and they have since started their own beef herd. They make weekly trips into the city supplying top restaurants and artisan butcher shops with their pork and beef. I love seeing new pig and cattle paddocks when I pick up market pigs at the Boe’s farm. They’ve moved to a more pasture-based growing since they started working with us. WIN! What’s the most gratifying part of owning and running your own farm? Sure, I get to do physical work outside every day and produce really delicious food, but the most gratifying part of our job is the relationships – customers, CSA members, fellow farmers, food advocates/activists, friends, family, and community that are nurtured by our farm. The image of the independent farmer, alone on the prairie is an unsustainable myth of “modern” agriculture. True resilience and sustainability are supported by an inter-locking bulwark of interdependent relationships. Adding strength and branches to that weave is what Cedar Valley Sustainable Farm is all about. Many thanks to Jody for sharing about his and Beth's lives as the farmers at Cedar Valley Sustainable Farm. Keep an eye out for a second post from him about his work with Band of Farmers - The Chicagoland CSA Coalition. We will also be preparing a post for CVSF's blog that we are very excited about, so be sure to follow us on Facebook for all the updates! Are there posts you would like to see from Sustainably Queer? We've got ideas for miles, but we'd love to hear from our readers first! Please let us know in the comments, on our Facebook Page, or join us in the Sustainably Queer group for more lively conversation! Ah, it’s finally spring in Chicago! Or at least the ground is thawing out. What I mean to say is it's time to start thinking about your garden. Yes, even if you've never gardened before. What should you grow if you are a new gardener? Well, in my opinion, you should try growing what you like to eat! I understand that can feel a bit daunting, so I’ve put together a specific things that you’ll probably be able to grow successfully even if you’ve never grown anything before! Green Beans - If you like to eat green beans, then you are in luck, because green beans grow like hot cakes in the Midwest. Follow the directions on the seed packet and you should be good to go. They are very prolific and hard to mess up. Just make sure you select “bush” varieties. Pop those seeds in the ground after June 1st! Green Onions - It's hard to throw off these plants. They are natural pest deterrents, and they just keep growing, even if you ignore them for a while. They are sometimes referred to as bunching onions. You can start onions pretty much any time after the ground is thawed out. Go wild! Herbs - Basil is a common beginner suggestion, and I would go along with that, but you might want to get it as a seedling/start*. Herbs like mint and oregano will come back year after year and will spread like wild, so only plant them in places where they will have room to expand or where you can keep them contained (like a big bucket or pot). Cilantro likes cooler weather and will quickly go to seed in the heat, so now is the best time to plant it, I promise. Peppers - Sweet peppers, hot peppers, you name it. If you buy a plant that has been started for you, rather than attempting to start peppers from seed, they are relatively easy to grow. They don't require staking or pruning. They love to produce over and over again once it gets hot, like August/September. Peppers like warm soil, so wait until the first of June to plant them outside. Peas - Peas are super easy to grow, but they like cool weather only. So, we should be planting peas like now. Which is to say you can plant them anytime after the ground thaws. Salad greens - Salad Greens - lettuce, spinach, arugula, that sort of thing - come up quickly in the spring and stay with us for a while. If you like salad, they can be a good way to start growing now and get some food on the table before summer crops like green beans and peppers even go in the ground. You can plant this stuff as soon as the ground is thawed. Most importantly, plants like their space - you know how seed packets list a recommended distance between seeds? Those recommendations are there for a reason. Follow those directions and your plants will thank you. Even if your garden looks a little barren or super spaced out while plants are growing, when roots and leaves have room to expand, it makes for better fruits and prevents disease. Remember this when you are putting plants in the ground! Have questions? You've got access to an urban farmer and horticulturist right here! Feel free to shoot me an email at sustainablyqueer@gmail.com. Two years ago, in April, Kristl and I decided that it would be a good idea to start a blog about the way we live. A lot has changed in two years. If you are feeling like you could never live a more sustainable life, like it's too expensive or time consuming, consider that it took us almost three years living together to start living the way you see us today. Sustainable living takes a little while to get used to. It's a transition! So, in honor of Earth Day, we give you How We Do Sustainable Living - Year Three! (For the 2013 installment, click here, and for 2014's version, click here.) Last year, we used a system of colors, bold lettering, and strike-throughs to communicate what we had changed. Let's be real, it confused all of us more than it was worth. This year we are going to start from scratch, but follow the same pattern. So, if you go back to previous years, you'll be able to follow our progress pretty easily. If you don't, you'll still get the picture. Buying post-consumer recycled paper products and recycled aluminum foil - We used to roast veggies on foil, but now we roast them on our Sil-Pat, which is easily cleaned and infinitely reusable, so we rarely use foil anymore. Simplifying and organizing our stuff - We hired a personal organizer to work with us a couple times to streamline our stuff. Organizing and downsizing frees us from clutter and helps us focus on the things that matter. Recycling, obviously - our building separates paper goods from containers, because we are a six-flat and have to contract our own recycling service. Thanks, Chicago. Using Chinese medicine/chiropractic/massage/Reiki/nutritional supplements in addition to Western medicine to keep us healthy - It would be weird if we didn't use alternative medicine, Kristl is an acupuncturist, after all. Using Oral Wellness HealThy Mouth Oil and EarthPaste to clean our teeth - No cavities and no added sweeteners. Daily meditation practice, exercise, and reading - Healthy body, healthy brain. Saving bacon fat and using it to cook other things - Butter and avocado oil tend to be our go-to fats these days, but bacon fat comes free with the bacon, so we totally use it. Meal planning for the week, and buying groceries based off the plan - Helps us keep in our budget and limit food waste. We carbonate our own water with our Soda Stream and add lemon or lime to it - Our days of making syrups, infused liquors, and shrubs are pretty much over. We make our own mayo with the immersion blender - Keep an eye out for a video on that trick! We cook 95% of our own meals - Try this at home, but remember, it took us a while to get to this point. Participate in True Nature's meat and egg co-op - $5/dozen for pastured eggs? Yes, please. Not buying cable - It's really easy now, because one of the things we sold when we moved was our TV. Making our own gifts - Much like Christmas 2013, we didn't spend too much on gifts for 2014. We would rather have good experiences with our friends and family than get things for and from them. When a gift is appropriate, we'll make it. Using backyard (and maybe community garden) to grow food - We missed out on our old community garden plot this year, but not to worry, there are always locations to grow vegetables. Rachel has plenty of offers on the table and she's making plans. Using mason jars for storage - We cut back on our random glass jar collection when we moved. Now we mostly use Mason jars and it does us just fine. Worm composting - We didn't do the best job of worm composting on our own, but our current living situation pays someone to worm compost in the basement. So we totally take advantage of that service our building offers. Living CAR FREE - We sold our car almost two months ago, and have adjusted just fine. We use the CTA more, we signed up for Enterprise CarShare, and we just bought Rachel a new bike to help with the transition. However, day to day, unless we are getting a huge load of groceries or going way out of our neighborhood, we don't really notice the difference. The best part is we don't have to worry about parking, street cleaning, city stickers, insurance, etc. There you have it, our lives in sustainability this year! There are probably things we do that we don't realize. We are in deep, folks! Sustainable living, especially in the city or on a small budget, is not a competition. It's not about keeping up with anyone; every little bit counts. Tell us what you are doing to live the sustainable lifestyle! Comment below or on our Earth Day post on Facebook! What you choose to eat or not eat in this time in history is probably one of the most confusing and baffling parts of life. This is true, especially, if you are interested in good health, animal or environmental welfare, or your pocketbook. If you are at a point in your life where you don't care about aforementioned concepts, by all means, skip to the next blog post. If figuring out the "best" way to eat is a constant internal conversation, stay and have that conversation with us for a bit. Let's talk about Sustainable Whole Food Nutrition. Kristl and I have come to this way of eating after struggling through thousands of dollars of mediocre restaurant food, easy convenience food, and home cooked food ranging from the lavish to the very simple. We have been those people who eat out every meal just because there is a restaurant they haven't tried. We have also eaten just potato chips and soda for dinner. Or brownies. And this isn't all like "in the past" either. In December, we definitely existed on nothing but white pizza for three days, and on Easter, we pigged out on candy (and then seriously suffered the consequences. Seriously.) No joke. Those are the exceptions. Let's talk about the rule. The rule is we want to eat what makes us feel good. We don't particularly care about weight gain or loss, or packing on muscle. We do have some things to take into consideration. I have epilepsy, and my neurologist, who doesn't seem to care about my diet at all, will admit that limiting your sugar consumption is better for your brain. There are numerous studies to back this up. I can tell you, without the help of any studies, that sugar does not make my brain feel good. Sugar also tends to make Kristl's gallbladder issues act up. So, for the sake of feeling good, processed sugar gets the boot. Ok, back to Sustainable Whole Food Nutrition. What does it mean? Why is it healthy? What can you feed us if we come over for dinner?! If you think way back before globalization, before industrialization, people ate what was available to them on their farm, in their community, and what was in season. There weren't factories to break down the food into boxes, and then put it in your freezer so you could heat it up in your microwave. People were confronted with the whole cabbage, the whole chicken, whole food. Now, no one is suggesting that we all go back to subsistence farming. However, the closer you are to your producer, the fresher the product is likely to be (not always, but usually.) This is sustainable because you are supporting the local economy with your dollars, and giant trucks are not going as far to bring you delicious food. For meat: Locally raised (five state radius), grass-fed, pastured (able to graze on grassland in appropriate weather), never treated with hormones, only given antibiotics in appropriate situations. Limit beef, and try to only cook with meat 3 days a week. Try to eat parts other than muscle. For fish: Salmon should be wild caught from Pacific waters, small fish are almost always better, avoid farmed seafood, especially from Asia. Eat fish 1-2 times a week. For eggs: Locally raised, grass-fed, pastured in season, organic feed otherwise. We eat as many eggs as we want. For dairy: We eat only grass-fed dairy products, and only whole fat (4%). This is a lot of Kerry Gold cheeses and Kalona cottage cheese and sour cream. Also, for butter we usually get Kerry Gold or Organic Valley Cultured. Grass fed is preferred, then organic local, then local, in that order. But we always want to avoid added hormones and antibiotics in our dairy. Eat all the fermented food! This includes pickles, sauerkraut, kimchi, sourdough bread, yogurt, kefir, etc, etc, etc. If it's cultured, we want it. Good bacteria to the maximum. Anything is easier to digest with fermentation! Consume bone broth daily. We make bone broth from bones left over from other dishes, and vegetable scraps. We do not necessarily consider bone broth a magical cure all, but there are lots of good minerals and collagen inside. Eat 8-9 servings of locally grown vegetables a day. "Locally grown using sustainable practices" trumps "organic" from California/Mexico/Peru. If it is not the growing season, we check out the Environmental Working Group's Pesticide Residue Data (a la Dirty Dozen) and make an informed decision about buying organic. We do eat frozen organic green beans and peas, because they are frozen very fresh, contain no salt, and are a great value from Costco. Eat nuts sparingly. Nuts are a great snack, and we enjoy a mixed nut butter called Nuttzo, but since few nuts are found locally we don't pig out on nuts. Eat fruits sparingly. The sugar from fruit is still sugar, so we snack on vegetables over fruits, but we probably average about 1 fruit a day. Avoid processed goods. If it comes in a bag or a box, isn't in the same shape it was when it came off the plant, has more than five ingredients, contains alcohol, and/or includes preservatives, "natural flavors" or fake colors, you can bet it's not coming home with us. Avoid processed sugar and alcohol. It makes us both sick and sad, but if processed sugar is as addictive as science says it is, then it probably makes a lot of people sick and sad. And Kristl is super allergic to alcohol. Womp. That's our way of eating. That's the long and short of it. That's what keeps us healthy, makes us happy, and shines a little light on the world around us. What I always tell people is that if it's not sustainable for you, then it's not going to be sustainable for the planet. If we had jumped in and tried to start eating this way when we started this blog two years ago, we would have started the week with an armful of vegetables and sunshine and ended the week with a bucket of frozen custard and shame. The vegetables would have rotted, we would have wasted our money. We weren't ready then. Big changes don't necessarily happen overnight, and it often takes more than good intentions to push you in that direction. The purpose of this post isn't to coerce you into adopting a Sustainable Whole Food Nutrition diet. Although, let me tell you, it is quite tasty. The purpose of this post is to demystify what these Sustainable Queers are doing over here and to inform you. We'd like some company. We are essentially pinging the depths. We want to know if there's anyone out there who eats like us. Do you eat a lot of vegetables? Do you value local food? Do you geek out over fermented foods and making sustainable choices? Do you cook most of your own meals? Maybe you don't right now, but you could find yourself heading that direction... let us know in the comments. Kristl and Rachel live in Durham, NC with their cat, Delilah. 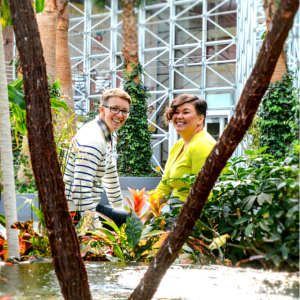 They love (and write about) sustainability, social justice, and queerness. Be the first to hear all of the Sustainably Queer news by signing up below! Thank you so much for letting us into your inbox!